ONE OF THE GREATEST MYSTERIES OF ALL TIME! On July 12, 2007, a team of 15 members left from Los Angeles on an Expedition to Nikumaroro (Gardner Island) which is a 2.5 mile uninhabited atoll about 1,800 miles south of Hawaii. Their mission was to search for any evidence that Earhart and Noonan may have been on the island. With the conclusion of the search at Nikumaroro Island by the TIGHAR group, THE VIEW IS BLEAK and the findings are a disappointment. With only the top of an oil can and zippers from a pile of junk salvaged from debris, the searches may, in the future, begin to wind down. Commentary from the TIGHAR site indicates that the effect of wind and water erosion have taken their toll on any artifacts that may be left on the island. Even the numerous voracious crabs could have played a part in removing or destroying any potential evidence. So ... the mystery continues after 80 years with no "smoking gun" or "proof positive evidence" that is tangible enough to write the definitive final chapter. Read more about it . . .
Books of interest include "The Sound of Wings" by Lovell, "My Courageous Sister", by Muriel Morrisey (Amelia�s sister) and Carol Osborne, "Amelia" by Goldstein and Dillion, "Amelia Earhart Case Solved", by Elgen and Maria Long, and �Legerdemain� by David K. Bowman, USNR (Ret.) which unmasks the alleged covert political slight of hand and deception behind the disappearance of the �First Lady of Aviation�. For the Japanese involvement theories, read "Amelia Earhart LIves" by Joe Klaas, "With Our Own Eyes" by Mike Campbell with Thomas Devine, "Amelia Earhart Returns from Saipan" by Joe Davidson and "Witness to the Execution" by Brennen. For Amelia Earhart returning to the United States as Irene Bolam, read "Amelia Earhart Survived" by Colonel Rollin C. Reineck. For exploration activities, read "Amelia Earhart's Shoes" by Thomas King, representing the TIGHAR theory that she ended up on Nikumaroro (Gardner Island). 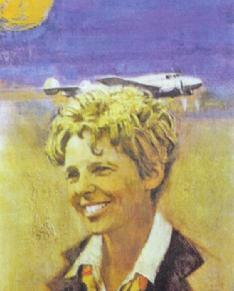 Perhaps the best kept secret in Earhart literature is "Earhart's Flight Into Yesterday". The publisher, R.E.G. Davis, is Curator of Commercial Aircraft at the Smithsonian Air & Space Museum, and himself the author of several aviation books. Based on an unpublished manuscript of Capt. Laurance F. Safford, USN, edited, revised and updated as necessary by author-researcher Cameron A. Warren with an assist by Safford scholar and retired Navy cryptologist Robert R. Payne, the book is an academic examination of the Earhart disappearance (subtitled "The Facts Without the Fiction"). A contemporary of Earhart, Capt. Safford, best known as the head of OP20-G, a top-secret Naval Intelligence organization and a key figure in the post WW II Pearl Harbor hearings, spent his retirement days in a thorough examination of Earhart's final flight, with the emphasis on the communication and direction-finding aspects. Mr. Warren spent over a dozen years checking out every detail covered by Safford, with the addition of material recovered from a number of archival sources, and pursued many leads suggested by the more credible contemporary authors. "Earhart's Flight Into Yesterday" (ISBN 1-888962-20-8), priced at $30, is available from the publisher: Paladwr Press, 1906 Wilson Lane, Apt. 101, McLean, Virginia, 22102. None of our researchers have found any hard evidence of a U.S. cover-up, although some visitors to our site believe a government cover-up continues to this day. The Marshall Islands were in the "mandates" and the Japanese prohibited the US from searching there, as they were beginning to start military build ups. The Japanese offered and did send at least one ship, the Koshu, to help out in the search. Some historians believe this ship actually picked up the plane and took Amelia & Fred to Saipan. Possibly the book that got it all going again appeared in 1966, by Fred Goerner, "The Search for Amelia Earhart", as described in the Overview section of this website. Please check www.amazon.com or your local library for availability of any of these books.